In what is fast becoming a Minnesota holiday tradition, Norway House’s fourth annual Gingerbread Wonderland is preparing for yet another blockbuster event. Last year, more than 11,000 people visited Gingerbread Wonderland, which showcases familiar Twin Cities buildings and landmarks rendered in gingerbread—with meticulously iced and assembled edifices—created by professional bakers and enthusiasts. This year’s event, which promises to feature a train and a Ferris wheel, opens Friday, November 16, from 5-8 p.m. Ticket info is here. The show continues through January 6. 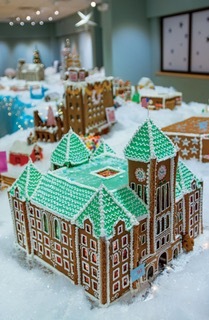 In the past three years, entries have included gingerbread replicas of iconic Twin Cities buildings such as Mickey’s Diner, Mill City Museum and ruins, Minneapolis City Hall and U.S. Bank Stadium. One year, a baker spent more than 100 hours designing and building a “Frozen” themed gingerbread castle. Bakers with all levels of experience—including cookie enthusiasts, families on a baking adventure, and professional bakers—were invited to contribute a house, structure, or building. Norway House even provided the recipe. 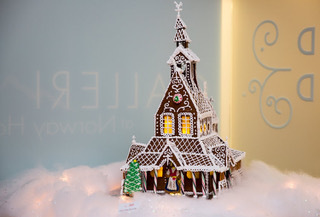 Known as pepperkake in Norwegian, gingerbread is a staple of the Norwegian holiday season and isn’t only used to create fanciful structures; gingerbread also appears as cookies, ornaments, and other décor. During Norway House’s Gingerbread Wonderful, visitors are encouraged to vote for their favorites on social media with using #MyGingerbreadWonderland.